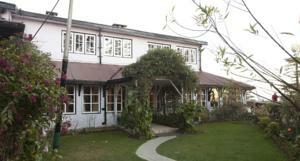 Springfield's hotel is located 1 km from downtown Shimla and 1.5 km from The Mall Shopping Complex. It offers a fitness centre and outdoor swimming pool. Free parking is offered. Springfield's, Shimla, is just 1 km from Hanuman Temple and 2.5 km from the State Museum. Jubbal Hatti Airport is 17 km from the hotel. Rooms are characterised by wooden flooring and brown colours. A minibar and tea and coffee making facilities are provided. Each room has a balcony. This hotel provides barbeque facilities in its garden. Its tour desk assists in sightseeing arrangements and currency exchanges. Laundry and dry cleaning services are also available. A traditional Indian meal or international cuisine can be enjoyed in the restaurant. Room service is also available. Free! All children under 5 years stay free of charge when using existing beds. One older child or adult is charged INR 1000 per person per night in an extra bed. Maximum capacity of extra beds/children's cots in a room is 1. Any type of extra bed or child's cot/crib is upon request and needs to be confirmed by the hotel. Supplements will not be calculated automatically in the total costs and have to be paid separately in the hotel.